Using value chain mapping and semi-structured interviews with value chain actors, SPRING conducted an adapted value chain analysis of fish and pumpkin to examine constraints and enablers to nutrition-sensitive agriculture. 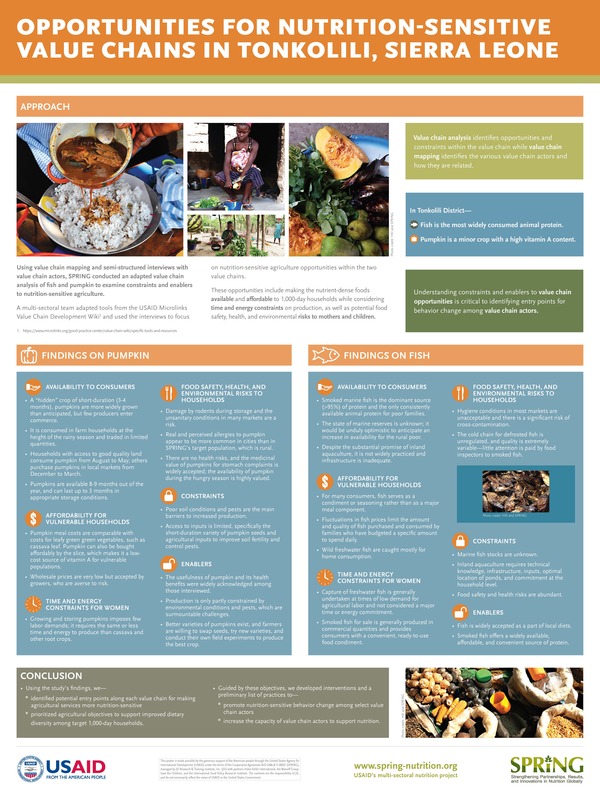 A multi-sectoral team adapted tools from the USAID Microlinks Value Chain Development Wiki and used the interviews to focus on nutrition-sensitive agriculture opportunities within the two value chains. These opportunities include making the nutrient-dense foods available and affordable to 1,000-day households while considering time and energy constraints on production, as well as potential food safety, health, and environmental risks to mothers and children. Value chain analysis identifies opportunities and constraints within the value chain while value chain mapping identifies the various value chain actors and how they are related. Fish is the most widely consumed animal protein. Pumpkin is a minor crop with a high vitamin A content. Understanding constraints and enablers to value chain opportunities is critical to identifying entry points for behavior change among value chain actors. A “hidden” crop of short-duration (3-4 months), pumpkins are more widely grown than anticipated, but few producers enter commerce. It is consumed in farm households at the height of the rainy season and traded in limited quantities. Households with access to good quality land consume pumpkin from August to May; others purchase pumpkins in local markets from December to March. Pumpkins are available 8-9 months out of the year, and can last up to 3 months in appropriate storage conditions. Pumpkin meal costs are comparable with costs for leafy green green vegetables, such as cassava leaf. Pumpkin can also be bought affordably by the slice, which makes it a lowcost source of vitamin A for vulnerable populations. Wholesale prices are very low but accepted by growers, who are averse to risk. Growing and storing pumpkins imposes few labor demands; it requires the same or less time and energy to produce than cassava and other root crops. Damage by rodents during storage and the unsanitary conditions in many markets are a risk. Real and perceived allergies to pumpkin appear to be more common in cities than in SPRING’s target population, which is rural. There are no health risks, and the medicinal value of pumpkins for stomach complaints is widely accepted; the availability of pumpkin during the hungry season is highly valued. Poor soil conditions and pests are the main barriers to increased production. Access to inputs is limited, specifically the short-duration variety of pumpkin seeds and agricultural inputs to improve soil fertility and control pests. The usefulness of pumpkin and its health benefits were widely acknowledged among those interviewed. Production is only partly constrained by environmental conditions and pests, which are surmountable challenges. Better varieties of pumpkins exist, and farmers are willing to swap seeds, try new varieties, and conduct their own field experiments to produce the best crop. Smoked marine fish is the dominant source (>95%) of protein and the only consistently available animal protein for poor families. The state of marine reserves is unknown; it would be unduly optimistic to anticipate an increase in availability for the rural poor. Despite the substantial promise of inland aquaculture, it is not widely practiced and infrastructure is inadequate. For many consumers, fish serves as a condiment or seasoning rather than as a major meal component. Fluctuations in fish prices limit the amount and quality of fish purchased and consumed by families who have budgeted a specific amount to spend daily. Wild freshwater fish are caught mostly for home consumption. Capture of freshwater fish is generally undertaken at times of low demand for agricultural labor and not considered a major time or energy commitment. Smoked fish for sale is generally produced in commercial quantities and provides consumers with a convenient, ready-to-use food condiment. Hygiene conditions in most markets are unacceptable and there is a significant risk of cross-contamination. The cold chain for defrosted fish is unregulated, and quality is extremely variable—little attention is paid by food inspectors to smoked fish. Marine fish stocks are unknown. Inland aquaculture requires technical knowledge, infrastructure, inputs, optimal location of ponds, and commitment at the household level. Food safety and health risks are abundant. Fish is widely accepted as a part of local diets. Smoked fish offers a widely available, affordable, and convenient source of protein. prioritized agricultural objectives to support improved dietary diversity among target 1,000-day households. increase the capacity of value chain actors to support nutrition.